This is a short animation showing Phobos rising and Deimos setting just above the horizon in the west in the pre-dawn hours of Sol 682 (Dec. 3, 2005). The time span for the three images that were merged into short time-lapse animation here is approximately 75 seconds. NASA's Mars Exploration Rover Spirit observed the Martian moon Phobos entering the shadow of Mars during the night of the rover's 675th sol (Nov. 27, 2005). The panoramic camera captured 16 images, spaced 10 seconds apart, covering the period from when Phobos was in full sunlight to when it was entirely in shadow. As with our own Moon during lunar eclipses on Earth, even when in the planet's shadow, Phobos was not entirely dark. The small amount of light still visible from Phobos is a kind of "Mars-shine" -- sunlight reflected through Mars' atmosphere and into the shadowed region. This view is a time-lapse composite of images taken 20 seconds apart, showing the movement of Phobos from left to right. (At 10 seconds apart, the images of the moon overlap each other.) Scientists are using information about the precise timing of Martian moon eclipses gained from observations such as these to refine calculations about the orbital path of Phobos. The precise position of Phobos will be important to any future spacecraft taking detailed pictures of the moon or landing on its surface. This clip is a sequence of the 16 images showing the eclipse at about 10 times normal speed. It shows the movement of Phobos from left to right as the moon enters the shadow. Scientists are using information about the precise timing of Martian moon eclipses gained from observations such as these to refine calculations about the orbital path of Phobos. The precise position of Phobos will be important to any future spacecraft taking detailed pictures of the moon or landing on its surface. 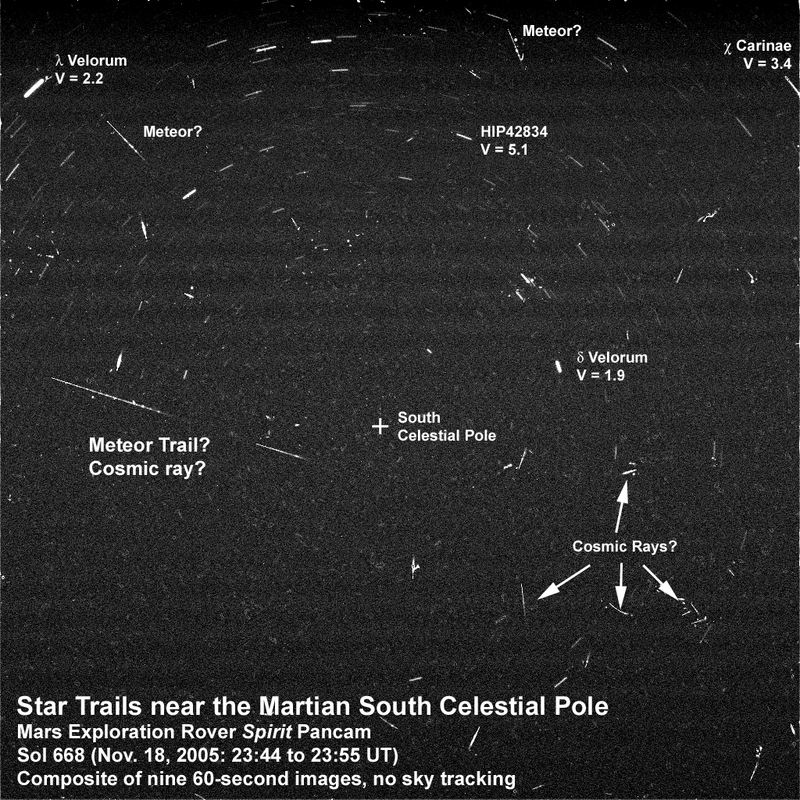 The views shown here are a composite of nine 60-second exposures taken with the panoramic camera on Spirit during night hours of sol 668 (Nov. 18, 2005), during a week when Mars was predicted to pass through a meteor stream associated with Halley's comet. The south celestial pole is at the center of the frame. Many stars can be seen in the images, appearing as short, curved streaks forming arcs around the center point. The star trails are curved because Mars is rotating while the camera takes the images. The brightest stars in this view would be easily visible to the naked eye, but the faintest ones are slightly dimmer than the human eye can detect. 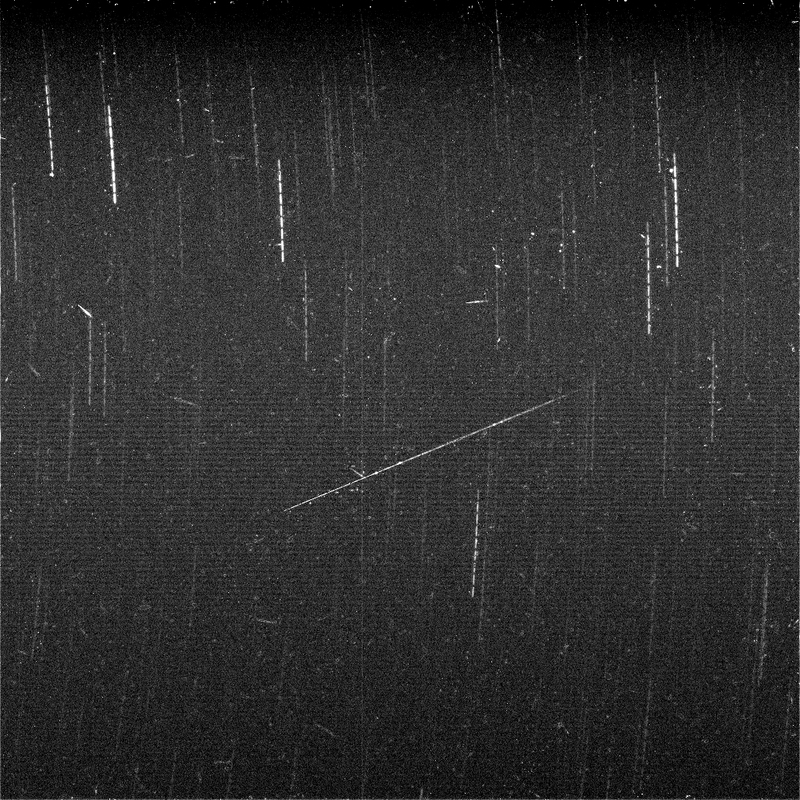 In addition to the star trails, there are several smaller linear streaks, dots and splotches that are the trails left by cosmic rays hitting the camera detectors. Cosmic rays are high-energy particles that are created in the Sun andsin other stars throughout our galaxy and travel through space in all directions. Some of them strike Earth or other planets, and ones that strike a digital camera detector can leave little tracks or splotches like those seen in these images. Because they come from all directions, some strike the detector face-on, and others strike at glancing angles. Some even skip across the detector like flat rocks skipped across a pond. These are very common phenomena to astronomers used to working with sensitive digital cameras like those in the Mars rovers, the Hubble Space Telescope, or other space probes, and while they can be a nuisance when taking pictures, they generally do not cause any lasting damage to the cameras. One streak in the image, crossing at an angle very different from the direction of the stars' "motion," might be a meteor trail or could be the mark of another cosmic ray. These observations can be used for various scientific purposes. These include helping to validate the models and predictions for interplanetary meteor storms, providing information on the rate of impacts of small meteoroids with Mars for comparison with rates for the Earth and Moon, assessing the rate and intensity of cosmic ray impact events in the Martian environment, and looking at whether some bright stars are being dimmed occasionally by water ice or dust clouds occurring at night during different Martian seasons. 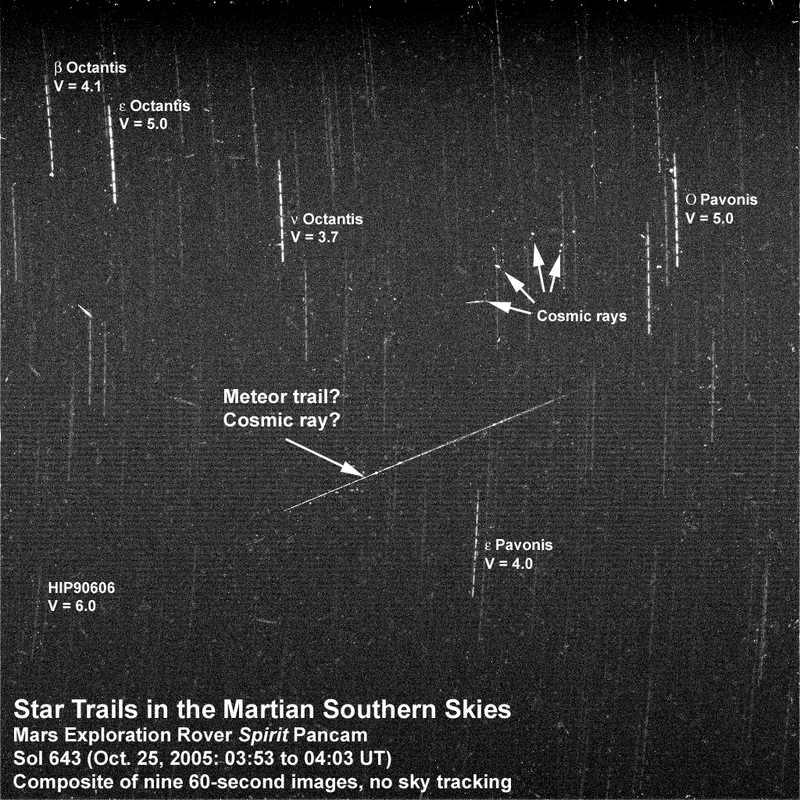 The views shown here are a composite of nine 60-second exposures taken with the panoramic camera on Spirit during night hours of sol 643 (Oct. 25, 2005), during a week when Mars was predicted to pass through a meteor stream associated with comet P/2001R1 LONEOS. Many stars can be seen in the images, appearing as curved "dash-dot" streaks. The star trails are curved because Mars is rotating while the camera takes the images. The dash-dot pattern is an artifact of taking an image for 60 seconds, then pausing about 10 seconds while the image is processed and stored by the rover's computer, then taking another image for 60 seconds, etc., for a total of about 10 minutes worth of "staring" at the night sky. Many stars from the southern constellations Octans and Pavonis can be seen in the images. The brightest ones in this view would be easily visible to the naked eye, but the faintest ones are slightly dimmer than the human eye can detect. NASA's Mars Exploration Rover Spirit continues to take advantage of extra solar energy by occasionally turning its cameras upward for night sky observations. Most recently, Spirit made a series of observations of bright star fields from the summit of "Husband Hill" in Gusev Crater on Mars. Scientists use the images to assess the cameras' sensitivity and to search for evidence of nighttime clouds or haze. The image on the left is a computer simulation of the stars in the constellation Orion. The next three images are actual views of Orion captured with Spirit's panoramic camera during exposures of 10, 30, and 60 seconds. Because Spirit is in the southern hemisphere of Mars, Orion appears upside down compared to how it would appear to viewers in the Northern Hemisphere of Earth. "Star trails" in the longer exposures are a result of the planet's rotation. The faintest stars visible in the 60-second exposure are about as bright as the faintest stars visible with the naked eye from Earth (about magnitude 6 in astronomical terms). The Orion Nebula, famous as a nursery of newly forming stars, is also visible in these images. Bright streaks in some parts of the images aren't stars or meteors or unidentified flying objects, but are caused by solar and galactic cosmic rays striking the camera's detector. Spirit acquired these images with the panoramic camera on Martian day, or sol, 632 (Oct. 13, 2005) at around 45 minutes past midnight local time, using the camera's broadband filter (wavelengths of 739 nanometers plus or minus 338 nanometers). This is a composite of night-time time lapse images of the martian moons Phobos and Deimos acquired by the Pancam instrument on the Mars Exploration Rover Spirit. The images were acquired on the night of Sol 594 (September 4, 2005), at a time when Phobos was passing Deimos in the night sky. Phobos is the brighter object on the left and Deimos is the dimmer object on the right; Phobos is moving from top to bottom and Deimos is moving from bottom to top in this sequence of images obtained every 150 seconds. The bright star Aldebaran as well as a few other moderately bright stars in the constellation Taurus can be seen forming star trails similar to those made by the moons. Most of the other "stars" and streaks seen in the images are from cosmic rays that lit up random groups of pixels in each of the images during the sequence. Because of the favorable power situation that the rover is in, Astronomers on the rover team are able to operate Spirit occasionally at night as a remote observatory from its perch high atop Husband Hill. Scientists are using such images to help to refine the orbital positions of the martian moons (which haven't been carefully monitored since the late 1980s), to detect and monitor the presence of night-time clouds or hazes at the Gusev landing site, and to learn more about the intrinsic compositional properties of the satellites themselves. The 7 images that went into this composite were acquired using the Pancam's broadband filter, which was designed for low-light imaging situations like this. The time span represented in this image sequence is about 20 minutes. This is a composite of night-time time lapse images of the martian moons Phobos and Deimos acquired by the Pancam instrument on the Mars Exploration Rover Spirit. The images were acquired on the night of Sol 590 (August 30, 2005), at a time when Phobos was passing Deimos in the night sky. Phobos is the brighter object on the left and Deimos is the dimmer object on the right; Phobos is moving from top to bottom and Deimos is moving from bottom to top in this sequence of images obtained every 170 seconds. The bright star Aldebaran as well as a few other moderately bright stars in the constellation Taurus can be seen forming star trails similar to those made by the moons. Most of the other "stars" and streaks seen in the images are from cosmic rays that lit up random groups of pixels in each of the images during the sequence. Because of the favorable power situation that the rover is in, Astronomers on the rover team are able to operate Spirit occasionally at night as a remote observatory from its perch high atop Husband Hill. Scientists are using such images to help to refine the orbital positions of the martian moons (which haven't been carefully monitored since the late 1980s), to detect and monitor the presence of night-time clouds or hazes at the Gusev landing site, and to learn more about the intrinsic compositional properties of the satellites themselves. The 6 images that went into this composite were acquired using the Pancam's broadband filter, which was designed for low-light imaging situations like this. The time span represented in this image sequence is about 20 minutes. The image on the left shows an enhanced view of one of the night-time images of the martian moons Phobos and Deimos acquired by the Pancam instrument on the Mars Exploration Rover Spirit. The image was acquired on the night of Sol 590 (August 30, 2005), just before Phobos passed Deimos in the night sky. The left image shows Phobos, the bright "star" in the upper left corner, and the dimmer "star" Deimos just above to the the right of Phobos. The bright star Aldebaran as well as a few other moderately bright stars in the constellation Taurus can be seen in the lower right of this image. Most of the other "stars" and streaks seen in the images are from cosmic rays that lit up random groups of pixels in each of the images during the sequence. However, an interesting and famous additional set of stars can be seen in the lower left corner: these are the Pleiades or "Seven Sisters", a star cluster that is easily seen from Earth in the night sky in winter in the northern hemisphere. In Earth's night sky, this star cluster is somewhat larger in the sky than the Full Moon. The right image provides an enhanced contrast view of this same scene, with annotation. Inset within the enhanced "halo" of light surrounding Phobos, we have inserted an actual sized, unsaturated view of the moon from a few images later in the same sequence. Here, we can compare the size of Phobos in the night sky of Mars with a familiar object like the Pleiades. Phobos, which would be easily visible to the naked eye in the martian night sky, would appear about one-third as large as the full Moon appears in the Earth's night sky. Astronauts staring at Phobos for even a short while in the night sky would notice its strange oblong shape, and that it moves quickly against the background stars. In fact, because it takes only 7 hours, 39 minutes to orbit Mars--much less than the 24 hour, 39 minute martian day or sol, Phobos actually rises in the west and sets in the east. Deimos, which would also be visible to the naked eye, would appear as a bright star, also moving significantly from night to night. With an orbital period of 30 hours, 12 minutes--which is longer than a martian sol--Deimos would rise in the east and set in the west, like most "normal" astronomical objects. The image on the right is the same as the first, but in inverted black and white. This is a composite of night-time time lapse images of the martian moons Phobos and Deimos acquired by the Pancam instrument on the Mars Exploration Rover Spirit. The images were acquired on the night of Sol 585 (August 25, 2005), at a time when Phobos was passing Deimos in the night sky. Phobos is the brighter object on the right and Deimos is the dimmer object on the left; Phobos is moving from bottom to top and Deimos is moving from top to bottom in this sequence of irregularly-spaced images. A few background stars from the constellation Sagittarius can be seen forming little star trails similar to those made by the moons. Most of the other "stars" and streaks seen in the images are from cosmic rays that lit up random groups of pixels in each of the images during the sequence. Because of the favorable power situation that the rover is in, Astronomers on the rover team are able to operate Spirit occasionally at night as a remote observatory from its perch high atop Husband Hill. Scientists are using such images to help to refine the orbital positions of the martian moons (which haven't been carefully monitored since the late 1980s), to detect and monitor the presence of night-time clouds or hazes at the Gusev landing site, and to learn more about the intrinsic compositional properties of the satellites themselves. The 5 images that went into this composite were acquired using the Pancam's broadband filter, which was designed for low-light imaging situations like this. The time span represented in this image sequence is about 20 minutes. This is an enhanced night-time image of the martian moon Phobos acquired by the Pancam instrument on the Mars Exploration Rover Spirit. The first image on the left shows six sequential Spirit images of Phobos aligned and combined in a process called "stacking" which reinforces consistent detail while averaging out noise. The next image to the right shows the result of enhancing the detail in that image with a mathematical image filtering process known as Laplacian sharpening. Phobos' large crater, Stickney is just out of sight in the upper right of these images. The image on the far right shows a photograph of Phobos acquired recently by the Mars Express HRSC camera, which is in a roughly similar orientation to the Spirit image of Phobos. To the left of that image is a version that has been blurred for comparison to the processed Spirit image. 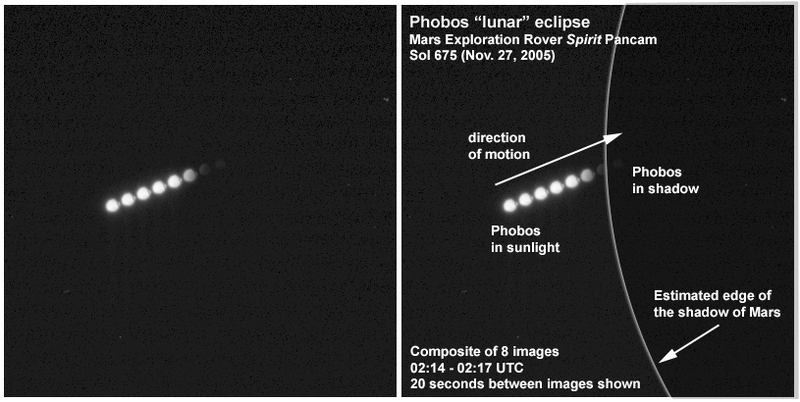 The Spirit Pancam images were acquired on the night of Sol 585 (August 25, 2005), at a time when Phobos was passing Deimos in the night sky. The Mars Express Phobos image was acquired on Orbit 413; more details about the Mars Express imaging of Phobos can be found at the ESA press release from which this image was acquired. 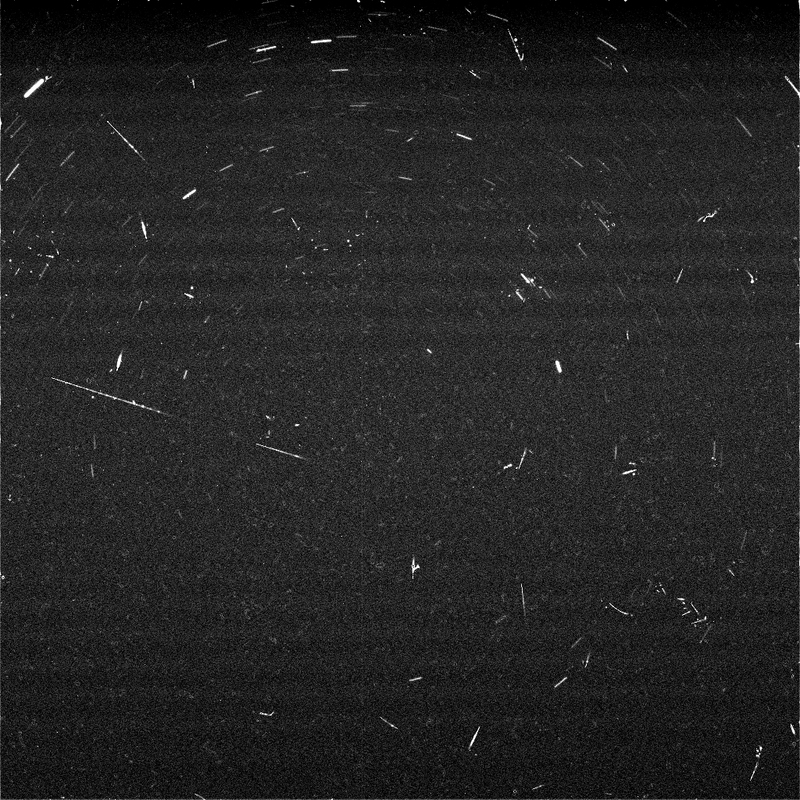 These are animated GIF files showing the motion of the martian moons Phobos and Deimos against the background stars of Sagittarius, captured by the Pancam instrument on the Mars Exploration Rover Spirit. The images were acquired on the night of Sol 585 (August 25, 2005), at a time when Phobos was passing Deimos in the night sky. Phobos is the brighter object on the right and Deimos is the dimmer object on the left in these enhanced brightness images. In the first image, the outline of the stars that form the famous "teapot" of Sagittarius are shown (in this case, the teapot was upside down, with Phobos heading towards the handle and Deimos heading towards the lid). The inset shows an enhanced and enlarged view of Phobos. The irregular, potato-shaped outline of the moon can be clearly seen, as well as the outline of the large impact crater Stickney, which forms the big hole in the upper right part of the moon. The second image shows the same view without the lines and text. The last image is the same view in inverted black and white. Because of the favorable power situation that the rover is in, Astronomers on the rover team are able to operate Spirit occasionally at night as a remote observatory from its perch high atop Husband Hill. Scientists are using such images to help to refine the orbital positions of the martian moons (which haven't been carefully monitored since the late 1980s), to detect and monitor the presence of night-time clouds or hazes at the Gusev landing site, and to learn more about the intrinsic compositional properties of the satellites themselves. The 6 images that went into this animation were acquired using the Pancam's broadband filter, which was designed for low-light imaging situations like this. The time span represented in this image sequence is about 20 minutes. Even though Phobos and Deimos move in opposite directions in the Martian sky (Phobos orbits around Mars faster than Mars spins on its axis--so it appears to rise in the west and set in the east! ), both satellites appear to move in the same direction in this animation because we have removed the overall motion of the sky from the time-lapse images. Thus, relative to the fixed stars, Phobos and Deimos appear to move in the same direction. That shouldn't be a surprise, after all, because they both orbit Mars in the same direction (counter-clockwise as viewed from above the north pole of Mars). The fact that Phobos orbits faster than Mars spins only makes it *appear* to be moving backwards. It's kind of like passing another car on the freeway--you're both going forward over 60 mph (probably), but the slower car appears to you in your car to be moving backwards when you pass. It's the same illusion!